Israeli commentator Meir Javedanfar has made a very successful career of trafficking conventional wisdom and mainstream narratives about Iran’s nuclear program. In a recent op-ed for the Guardian newspaper he has insisted – as he has done for years now – that the economic warfare and collective punishment exacted upon Iran at the behest of the United States and Israel is a beneficial policy that has made the Iranian government more malleable and amenable to Western diktat over its uranium enrichment program. A recent spate of informed analysis and reports from establishment institutions has acknowledged the failure of sanctions to bully Iran into capitulating to illegal and hypocritical Western demands. New studies have also found that the Iranian economy has nimbly adapted to the restrictions imposed by sanctions, offering more production, growth and diversification than may have been possible without them. Refusing to bow to such credible research, Mr. Javedanfar has held fast to the perspective that “sanctions have proved themselves to be effective” in forcing Iranian leader Ayatollah Ali Khamenei to reenter negotiations and consider curbing Iran’s nuclear program. In his op-ed, Javedanfar highlights a sequence of events over the past few years to show that Iran’s decisions to engage in talks have been directly influenced by embargoes on Iranian oil and gas, which have hurt the Islamic Republic’s economy. But the facts simply don’t work in Mr. Javedanfar’s favor. Read that last sentence once more, before we continue. Please. Ok, one more time. Now remember it. Mr. Javedanfar notes that “Iran started producing 20% enriched uranium in February 2010,” yet conveniently omits why Iran made the decision to do so in the first place. Let’s review the history Javedanfar doesn’t disclose. Uranium enriched to nearly 20% – a higher threshold than needed to fuel nuclear power plants, but far below that which is needed to manufacture a nuclear weapon – was necessary to keep the Tehran Research Reactor (TRR) producing medical radioisotopes used to treat nearly a million Iranian cancer patients. In advance of the depletion of its reactor fuel, Iran tried to purchase more enriched uranium on the open market under full IAEA supervision. We have in the past bought the 20% enriched uranium from other countries—not from the United States. Now we could buy it from the United States. I think it is a good place to start for cooperating and talking. It is an issue that is humanitarian—it is about medicine. Nevertheless, during the Geneva talks in early October 2009, the United States and its European partners prevented any discussion of a commercial sale. Instead, they offered a “swap” proposal whereby Iran would ship out most of its stockpiled low-enriched uranium to Russia to be enriched to 19.75%. This would then be shipped to France where fuel rods that could power the TRR would be produced. Iran would then, theoretically, receive those rods a year after shipping out its stockpile. Iran agreed in principle to this arrangement, with the intention of hammering out mutually acceptable and beneficial details at a later date. As the parties’ discussed final terms, Mottaki suggested Iran initially hand over a quarter of its enriched uranium stockpile in a simultaneous exchange for an equivalent amount of processed fuel for use in the medical research reactor. The remainder of the uranium would then be traded over “several years,” under an agreed upon and internationally supervised framework. This proposed timetable was immediately rejected by Western powers. An unidentified senior U.S. official was quoted by the Voice of America as claiming that the Iranian counter-proposal was inconsistent with the “fair and balanced” draft agreement. Secretary of State Hillary Clinton urged the Islamic Republic to “accept the agreement as proposed because we are not altering it.” Such is the nature of Western negotiations with Iran: ultimatums, not diplomacy. Once any chance of a negotiated solution had been scuttled by the United States’ refusal to act in good faith, Iran pressed forward with its plan to domestically produce the needed fuel. In his recent Guardian article, Mr. Javedanfar states that Iran had no reason to enrich to the 20% level since there had been “repeated proposals by the P5+1 to do this abroad as part of a swap deal.” His claim clearly contradicts the historical record on the parties’ negotiations. Contrary to what Javedanfar would have his readers believe, the reason Iran began enriching uranium to 20% in February 2010 (under the full supervision of the IAEA) was due to U.S. recalcitrance. Still, that very month, then-AEOI Director Ali Akbar Salehi expressed hope that a deal could be struck. “We have the capability to enrich uranium to any percentage we wish, but we asked the [International Atomic Energy] Agency to ask other countries that could supply the 20-percent [enriched uranium] because we did not want to go beyond five percent. But they did not respond,” Salehi told Iran’s PressTV in a live interview on February 9, 2010. “All we have asked the West or countries that have the capacity to produce the fuel is ‘Please supply us with the fuel,’” he said. “So the deal is still on the table. If they come forward and supply the fuel, then we will stop the 20-percent enrichment,” Salehi added. Repeating himself just days later in an interview with Al Jazeera, Salehi said on February 12, 2010, "If they are ready to supply the fuel plates, we will stop the [20%] enrichment." Such a development was deemed ”wholly unjustified” by P5+1 officials. A month later, having received no positive response from the United States and its partners and amid talk of additional Western sanctions on Iran, Ali Asghar Soltaniyeh, Iran’s envoy to the IAEA, “warned that sanctions would prompt his country to reject the uranium exchange deal, and called on the West to carry out the deal as proposed by Iran, namely to perform the exchange on Iranian soil,” according to a report in the Iranian media. Throughout 2010 and 2011, the UN Security Council levied another round of sanctions, a deal struck by Brazil and Turkey with Iran was rejected by the United States, and threats of military action against Iran continued unabated. Iranian officials were, however, still talking of halting their 20% enrichment activities. “We will consider halting uranium enrichment whenever nuclear fuel is provided to us,” Ahmadinejad told the Associated Press. A year later, Ahmadinejad was still reiterating this proposal. If they give us the 20% enriched uranium this very week, we will cease the domestic enrichment of uranium of up to 20% this very week…We don’t want to produce uranium of 20%. Because they did not give us that uranium, we had to make our own investments. If they start to give us that uranium today, we will stop production… If they give us uranium grade 20%, we would stop production… I repeat: If you give us uranium grade 20% now, we will stop production. Because uranium grade 20% can only be used for such reactors, nothing else. Over the next few weeks, Ahmadinejad repeated this offer in other international and Iranian media outlets. So much for the Iranian government refusing “to even address its 20% enriched uranium process” prior to 2012. What else does Javedanfar claim? That “sanctions have also affected Iran’s decision-making about its stockpile of 20% enriched uranium.” What’s his evidence? That Iran has been converting its 20% enriched uranium to nuclear reactor fuel plates, thus precluding the further enrichment of such material to weapons grade level and thereby reducing the proliferation risk posed by Iran’s 20% stockpile. Time to check the calendar again. As usual, what Mr. Javedanfar excludes from his analysis is just as important as what he chooses to include. In truth, Iran had already made the decision to convert portions of its 20% stockpile to fuel plates before the E.U. embargo was agreed upon and unveiled. In mid-July 2010, AEOI chief Ali Akbar Salehi revealed Iran’s goal of manufacturing domestically produced reactor fuel by September 2011. “At present we have produced about 20 kg of 20%-enriched uranium and we are now producing fuel plates,” he told reporters. 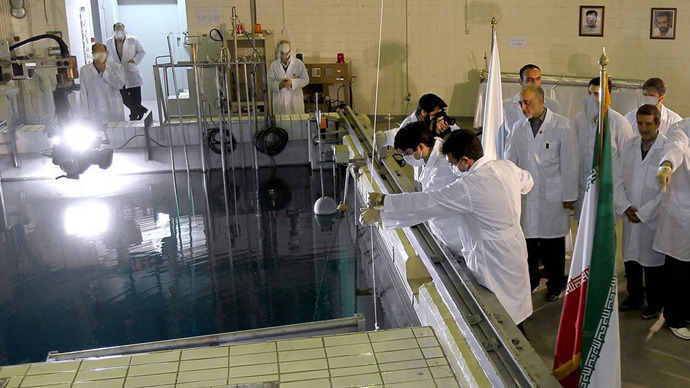 On January 9, 2012, under the supervision and seal of the IAEA, Iran began enriching uranium to 20% at its Fordo facility. Two weeks after that, on January 23, 2012, the European Union announced the oil embargo. Iranian decision-making was unaltered by this announcement, as its enrichment and conversion efforts progressed unabated. By the middle of the next month, Iran was loading domestically-produced fuel plates in the Tehran Research Reactor. By June 2012, Iran had successfully converted about one-third of its 20% stockpile to fuel plates. It has continued this process ever since, while continuing to offer suspending its 20% enrichment if the right conditions are met. Meanwhile, European courts have been striking down the very banking sanctions praised by Javedanfar as illegal and Iran’s impressive scientific and technological progress expose both the impotence and futility of the U.S.-led sanctions effort. Apparently, Mr. Javedanfar is well-versed in the employment of the logical fallacy post-hoc ergo propter hoc; that is, arguing that “because event Y occurred after event X, therefore X caused Y.” Similar claims were made last month by the editorial board of The Washington Post, crediting Israeli Prime Minister Benjamin Netanyahu with scaring the Iranians into reducing their stockpile with the flick of a red magic marker. Matt Duss, policy analyst at the Center for American Progress, efficiently debunked this nonsense. Now, Javedanfar has attempted to resuscitate the claim by setting the catalyzing event (the approval of E.U. sanctions, rather than Netanyahu’s pen and cartoon bomb charade) back nine months. He just didn’t go far enough. If he had, he might have noted that the Iranians have been open to negotiation over its nuclear program, as well as repairing U.S.-Iranian relations, for a decade now. Javedanfar’s dearth of actual insight – or basic research skills – demonstrates his unshakeable fealty to mainstream, often Washington and Tel Aviv-driven, talking points and continued support for a meaningless sanctions regime that has done nothing but increase the chance of armed conflict and cause a great deal of suffering for the Iranian people. If Javedanfar truly believes sanctions are sound policy, vindicated by yielding what he deems to be positive results, he is certainly entitled to his own opinions. Pontification on causation is surely what political commentators get paid to do. What cannot be manipulated, however, are basic facts or the sequence of events. With such prolific false analysis, it is no surprise truth is a rare commodity when it comes to media coverage of Iran’s nuclear program. May 19, 2013 - Mr. Javedanfar, rather than reply honestly and forthrightly to the issues addressed in this post, has apparently tasked some of his "former students" to post some rebuttals in the comment section over at Muftah, where this article was first published. The comments are, shall we say, unimpressive and actually demonstrate, beyond a shadow of a doubt, just how incorrect some of Mr. Javedanfar's claims actually are and how uninformed he and those he teaches are about issues he gets paid to write about. I have responded to these rejoinders at length. You can read my response at this link.